Lush is the creator of two of my favourite scents and products of all time: Rose Jam and Sleepy. Rose Jam shower gel only comes out at Christmas so I get a big bottle and use it sparingly so it lasts until next year! It leaves the skin beautifully perfumed and so soft that I can get away without using a body lotion in the mornings. 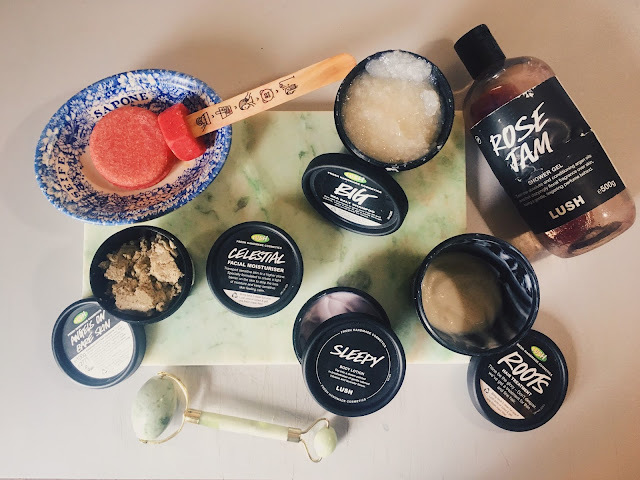 Ideally I would layer the scent with one of my oldest favourites from Lush, Ro's Argan body conditioner, however, I ran out a while ago and need to repurchase! Sleepy has one of the most relaxing scents and I put it on every night before bed, even when I'm drunk after a night out because I struggle to sleep without it! It doesn't actually cause you to sleep so it won't cure your insomnia, however if you struggle to wind down in the evenings this can definitely soothe your mind and get you ready for bed! The scent is very comforting, with Tonka bean and lavender and it's a nice product to add into your night routine for an easier night's sleep. 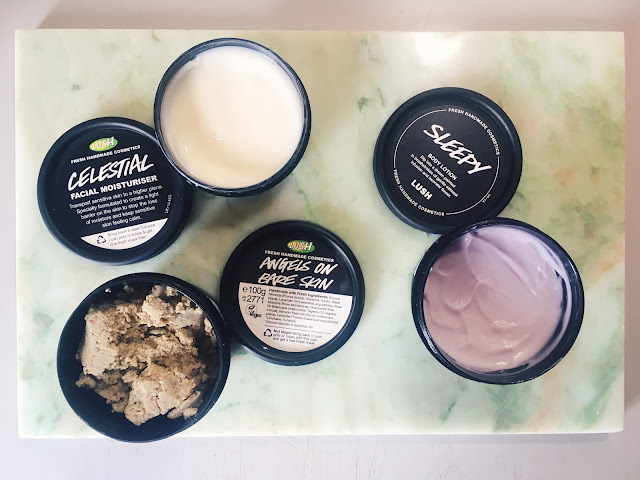 Recently, I went a bit mad at Lush and bought lots of products I've never tried before and an old favourite that I'd forgotten about. Angels on Bare Skin was one of the first cleansers I ever bought so there's a little bit of sentimental value attached to it. I'm happy to have it in my collection again. It's a really gentle cleanser that turns into a milk when mixed with water. It lightly exfoliates the skin with ground up almonds, leaving it baby soft. I liked the idea of a simple, natural moisturiser so I picked up Celestial which has hardly any ingredients at all! It's made of almond oil, almond milk, orchid extract, vanilla water and cocoa butter and a few other ingredients. It feels lovely on the skin but I'm unsure on whether it's right for me just yet. It definitely doesn't beat Tidal by Sunday Riley but it is a hell of a lot cheaper! Next, I went for some hair products as a few months ago I had my hair chopped off and have been filled with regret ever since. Roots is a hair mask that contains peppermint, which stimulates the scalp to encourage hair growth, while New bar shampoo and New hot oil treatment both contain cinnamon to do the same thing. So far I've been using Roots once a week and use New bar shampoo every time I wash my hair. Roots feels amazing when massaged into the scalp due to the three types of mint within in! I also picked up Big shampoo as I've always wanted to try it. It promises volume which my fine, flat hair needs!